Seven member, all male classic a cappella rockers The Exboyfriends were the classic "small NYC clubs to Sweepstakes" story, starting out in the former in 1993 and working their way up to the latter, winning Audience Favorite at the 2000 Harmony Sweeps National Finals in San Rafael, CA. Along their journey they appeared on VH1, Nickelodeon, NBC's Today show, the Howard Stern Show and many others. They also opened for groups like the Marshall Tucker Band and the Edgar Winter Group. "A Cappella's Dead," their 1999 debut CD, won rave reviews from us and was called the "classic rock album a cappella has been waiting for" by RARB. Their follow up "Karaoke Bar Brawl" won even more praise, being nominated for two CARA awards, and was one of RARB's "Picks of 2003" for album of the year. At the time of their "farewell" 2008 show, "Happy Ending" lay unfinished in digital purgatory, but after a long break from performing and recording the 7 guys got together to finish the album with producer Ed Chung, and staged a reunion concert in their hometown in May of 2013. After all that background, we'll be brief: we loved the ExBs at the 2000 Finals, and "Happy Ending" is a beautiful, powerful a cappella cover album of 10 songs, one of the best we've heard this year! Beside the hauntingly surreal Pink Floyd anthem "In The Flesh," some of our favorites are The Eagles' "Hotel California," which segues into a manic salsa-flavored party with body percussion and faux trumpets; U2's "Sunday Bloody Sunday," and B. Brown's "Teenage Dirtbag," which necessitated a Parental Advisory on the album cover ("We Curse A Lot"). J. Walsh's classic "Life's Been Good" and M. Jones' "Feels Like the First Time" are stone winners, as is D. Roeser's "(Don't Fear) The Reaper" and the top-40 hits "Dirty Work" and "Hunger Strike." 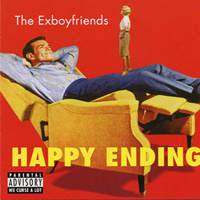 It's been a long wait to hear more sweetly arranged, top-tier a cappella from the Exboyfriends, but after listening to "Happy Endings" we, and a lot of their fans, are wishing they had never left!